I opted to write an undergraduate thesis when I was in college. It proved to be more work than I could ever imagine. It took a little over a year. It took some hair, a pinky fingernail, and some academic confidence with it as well. I was one of the lucky ones. I only had to revise it one time. I have heard stories of people having multiple extensions and paying thousands of dollars in extra tuition just so they can have more time to submit their dissertations. To summarize (because 45 pages is no joke), the more persuasive you are, the better your quality of life will be. That is a watered-down, pale summary of what I really said. OK. What does all of that have to do with food? Nothing. But it's been four years this month since I toiled over a dimly lit computer screen to produce that work of mine. Today, I've been inspired to toil in a dimly lit kitchen to produce another kind of work. 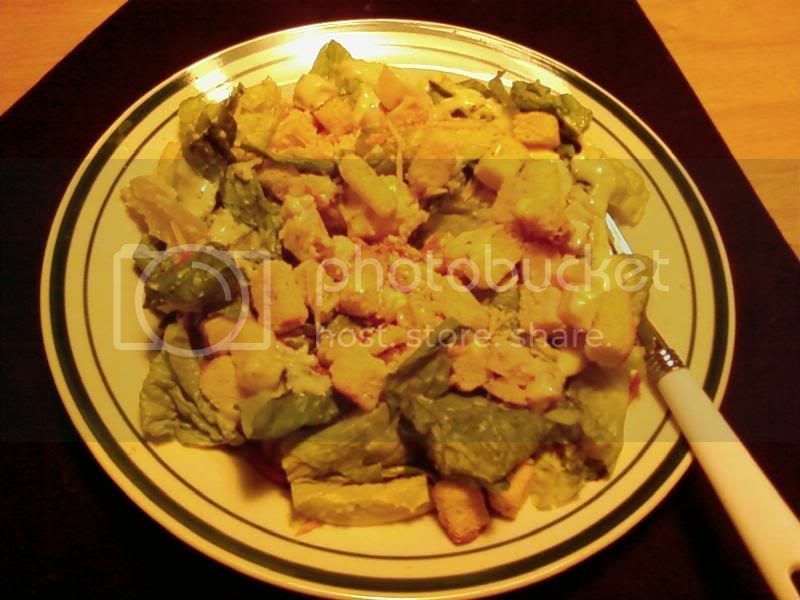 I decided to make a Caesar salad in an attempt to make an ode to our favorite Roman deity, Julius Caesar. The original Caesar salad had nothing to do with Julius, Romans, Italy, or anything Mediterranean. Its birthplace is in Mexico. Tijuana, Mexico to be exact. Folklore tells us that an Italian gentleman by the name of Caesar Cardini birthed this salad in an attempt to make do with what he had on hand in his restaurant when ingredients were low. His Mexican locale was due to his great idea of dodging prohibition laws in the 1920s and 30s. I like my dressing garlicky, spicy, and full of flavor. I like it fluffy and thick, too. You can reduce the garlic amount but I really love the recipe like this. Using extra-virgin olive oil is OK here, but if you don't want to use your "good" oil for this, a regular olive oil will work too. Vegetable and canola are acceptable in a pinch. The whole eggs are what make the dressing full. Leaving them out won't detract from the flavor. I don't use anchovies because the Parmesan and Worcestershire add enough sodium. As a matter of fact, the anchovy is one of the many ingredients in Worcestershire sauce. And once again, the flavor is not affected by the lack of little salted fish. In a food processor or blender, combine vinegar, lemon juice, eggs, Worcestershire sauce, mustard, garlic, and Parmesan cheese. Slowly add oil to create an emulsion. Process until smooth. Dressing keeps up to one week in refrigerator. If dressing is too thick, pour small amounts of ice cold water into emulsion while processor/blender is running until desired consistency. If dressing is too vinegary, keep adding oil until desired taste. If dressing is too oily, add more red wine vinegar. In a large saute pan, melt butter over medium heat. Stir in garlic; cook and stir for 1 minute. Pour butter mixture over bread cubes and toss to coat. Spread on a baking sheet. Bake for 15 minutes, or until crisp and dry. Cool. Croutons will crisp upon cooling. I went back to finish college when I was 40, finishing when I was 42. I had to do a thesis as well, so I FEEL YOUR PAIN! Only 1 revision though. A good Caesar salad is always best with homemade dressing. Nicely done. I havent had a decent Ceaser Sald in a while. Yours looks scrumptious. Mr Orph: I commend you on continuing your education as a non-traditional student. Glamah: Thanks to you too. It really was delish. I can still taste the garlic in the back of my throat. I love my Caesar extra garlicky too. It's really the only right way, if you ask me. Heather: the only thing I have to say to that is "Hell yeah!"